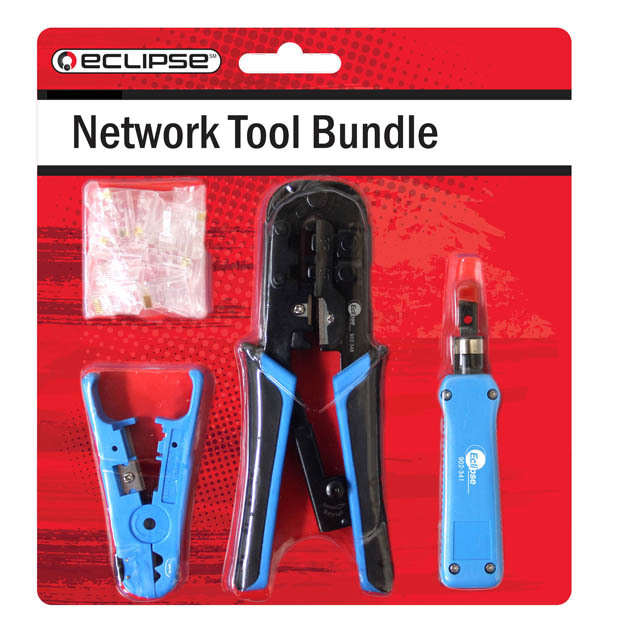 Bundle contains three tools including a wire stripping tool, modular plug crimping tool, and a 110/88 impact punchdown tool. Universal cable stripper for stripping flat wire for stranded phone wire 2P, 4P, 6P, 8P, 10P, etc; intercom/ alarm wire/ 2-cord speaker wire from 18-22 AWG max and SPT-1 electric wires. Stripping round cable for round cable-tough plastic insulations 12-14-16 AWG cable SPT-2 electric wires and assorted solid modular wire UTP STP data communication wires, network cables and multi-conductor cable insulation. Impact punch down tool features 110/88 blade with cut function on one end. Modular crimping tool features application for 4/ 6/ 8P modular connector.